I'm a little late on this post as Thanksgiving Day has passed, but honestly, why should feelings of gratitude and thankfulness abruptly give way to the materialistic frenzy of Black Friday? They shouldn't. I'm still immensely thankful to have a lovely home and to have my family near me: safe, happy and healthy. And when so many in this world do not have a home and are not able to keep their families safe and happy and healthy, I hope I'll continue to be thankful regardless of the day or season. In particular, knowing that hundreds of thousands of Syrian men, women and children are terrorized and displaced by ISIS humbles me. The heated debates over this crisis in the news and on social media show that it's easy to let fear, mistrust, self-righteousness and self-love be the lens through which we see the world. But because of Jesus, I'm compelled toward compassion, and I hope to model it for my boys. 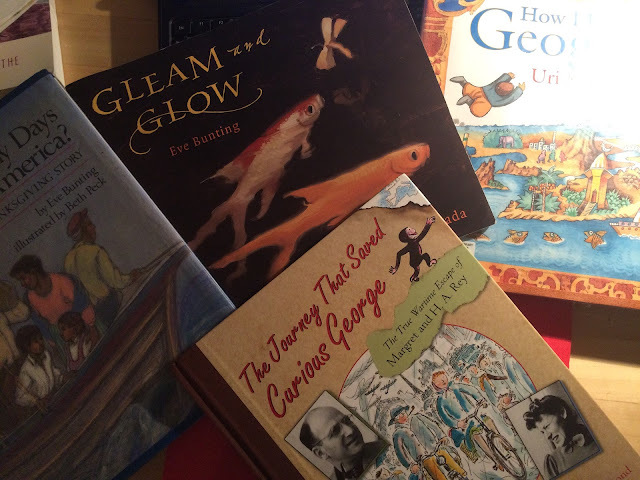 So with these thoughts in mind, I bring you four moving picture books (found at my local library) that make the concept of a refugee a little more personal. For me, How Many Days To America? : A Thanksgiving Story by Eve Bunting and illustrated by Beth Peck perfectly united both a sense of gratitude for our country's freedoms and bounties as well as a sense of duty to maintain our long tradition of receiving those who are fleeing religious and political persecution. For my kids, it tells a rather gripping tale of a family who leave all their possessions behind to escape their Caribbean island home by boat. They face rough weather, food shortages, pirates and rejection from other potential destinations before finally being received in the United States on Thanksgiving day. While I found the story engrossing and my boys aged 2-7 stayed tuned in to the end, they were mostly interested in knowing whether pirates still existed today and why the pirates in the book didn't look like the Veggie Tale variety. Gleam and Glow, also written by Eve Bunting and gorgeously illustrated by Peter Sylvada, is another picture book that tugs on heart strings as it depicts the fear and uncertainty faced by a young Eastern European family forced to leave their beloved farm and escape on foot for a refugee camp. The night before leaving, a little boy releases his younger sister Marina's beloved pet fish into their pond because, even "an extra day or two of life is as important to a fish as it is to us." Many months later, when the family returns to their country, they find a landscape charred by war. Their own farm has only small resemblances to the home they once knew. Marina rushes to the pond, hoping to find her two fish. What she finds instead shocks the entire family and serves as a fitting metaphor for the refugee experience. How I Learned Geography by Uri Shulevitz is a beautiful picture book that tells the author's own story of being a refugee in a strange new country. Instead of emphasizing the fears Jews faced during World War II, Shulevitz focuses on the extreme poverty, hunger and a longing for escape that accompany refugee life. He does this by telling what happens when his father returned from the bazaar not with the promised bread that would be the day's meal, but with a beautiful wall-sized map. At first bitter about having to sleep on an empty stomach, the young Uri eventually is able to escape his hunger through an imagination-fueled adventure inspired by the map. The Journey That Saved Curious George by Louise Borden and illustrated by Allan Drummond uses a scrapbook format to chronicle the story of Margret and H.A. Rey, both Jewish and both originally from Hamburg, Germany. This book is really neat for several reasons. First, all three of my kids are or at least have been Curious George fanatics. This book is a worthwhile read just to get to know the husband and wife team that dreamed up this little monkey. (Fun Fact: They had two pet marmosets as newly weds in Brazil.) Second, the Reys were truly global citizens-- speaking many languages and living in Germany, Rio de Janeiro, London, Paris, Lisbon and eventually the U.S. My oldest son has really enjoyed learning Spanish in school. This book shows him the freedom, adventure and opportunities multilingualism can afford. Finally, and most importantly, the story gently introduces children to the drama of World War II, as the Reys narrowly escaped Paris on bicycles days before Hitler's invasion. Like my other three picks for the "Children's Refugee Picture Book" genre, it provides a hopeful, happy ending, despite some harrowing days of fleeing before dawn and depending on strangers for food and lodging.